On the eastern edge of the Downtown Eastside, Ray-Cam Cooperative Community Centre has been providing support, services, and a place for East Side families since 1976. For forty years, Ray-Cam Cooperative Community Centre has been serving the Downtown Eastside and some of our city’s most vulnerable populations. Over 18,500 people live in the Downtown Eastside, more than half are low income, dependent on welfare support, pensions, charitable and/or social services. Ray-Cam is one of Vancouver’s highest membership, most frequently used community centres — a welcoming, family-oriented, safe space, with recreation and programming for people of all income levels, including youth, seniors, new immigrants, and indigenous residents. Over 700 volunteers take an active role in decision-making and staffing, along with program and service delivery for over 6,000 members. The Ray-Cam site is was formally dedicated to the community in perpetuity by original site owner Canada Mortgage and Housing Corp. It is now retained by BC Housing. The facilities are jointly managed by the Ray-Cam Cooperative and the City of Vancouver under the Park Board. Through recent local area planning and rezoning, Ray-Cam’s aging two-story site is now potentially developable at 6.0 FSR and up to twelve storeys. The Ray-Cam Renewal Plan represents almost three years of visioning and productive collaboration between our Renewal team and stakeholders including community, staff, potential partners, and professional consultants. A renewed Ray-Cam envisions a neighbourhood centre with services and housing to meet the needs of the local population. A fully inclusive multi-generational community, with social and rental housing affordable for local residents. Expanded recreational, child care, seniors, local health and youth programs. Facilities for partner organizations, NGO’s, and local startup enterprises; and potential leasable space for local serving businesses. Today, the Centre functions at capacity, and increasing population and program demands are stressing Ray-Cam’s ability to deliver services to the community. The City of Vancouver’s Downtown Eastside Local Area Plan (2014) further anticipates significant population increase over the next thirty years, including over 6,000 new units of social and supportive housing for homeless and low income families and singles in the immediate area. To implement the DTES Plan’s principles and projections, Vancouver City Council approved a Great Beginnings Grant for the local Ray-Cam community and centre’s staff, to envision how Ray-Cam should expand to meet the needs of existing and new residents in a changing neighbourhood. Out of this ongoing process has emerged a vision for a new purpose-built community centre: with social housing above and expanded key services like recreation, child care, seniors facilities, trades training and cultural space; as well as a hub for partner organizations, local serving retail along the Hastings high street and strengthened pedestrian connections in the neighbourhood. The cooperative’s origins as a grassroots response to neighbourhood needs inform Ray-Cam’s guiding values today. Those values include the promotion of public safety and community recreation, a focus on the needs of children and families, and providing a welcoming space for new arrivals and immigrants in the community. Informed by First Nation’s traditions and Canada’s Truth and Reconciliation Recommendations, Ray-Cam’s renewal is guided by the indigenous philosophy of Seven Generations; building for the present, as well as three generations past and three generations in the future. As Vancouver’s downtown core expands eastward, urban development pressures including the Strathcona Village by Wall Financial, the new St. Paul’s Hospital and Campus, and Low Tide’s many acquisitions in the immediate area, underscore the need for proactive community and affordable housing development. Forward-thinking projects such as the Nnə́c̓aʔmat ct Public Library with YWCA Housing above, and a renewed Ray-Cam show the way forward to an inclusive future for all residents. Incorporating social, health, and recreational services, a renewed Ray-Cam will address the needs of current and future local residents, providing multi-generational housing, including seniors and supportive housing, as well as social housing and low-end market rentals as part of developing a fully inclusive community. Ultimately, Ray-Cam’s renewal is not just about building a new facility; it’s a proposal to create a new kind of neighborhood centre that builds on past successes, and through citizen participation and collaboration allows the heart of the community to grow and keep pace with the high density growth planned in this part of the City. Ray-Cam opened in 1976 as a social recreation centre and food co-operative, and over the years has developed into a full fledged community-run service centre. The genesis of the centre goes back even further to the Militant Mothers of Raymur. Their action in the winter of 1971 staged a sit-in on nearby railway tracks to protect the safety of their children. In 1970, mothers living in the then newly built Raymur Social Housing Project (today known as Stamp’s Place) were concerned about the safety of their children crossing a set of active railway tracks to attend nearby Seymour Elementary School. After months of petitions, letters, and speeches to City Hall: a group of 25 mothers —many of them low income, women of colour, and single moms— fed up with City and rail company inaction, staged a sit-in on the tracks, effectively blocking rail traffic. These moms came to be known as the Militant Mothers of Raymur, their action galvanized the community, and ultimately spurred the City and railway to respond with safer train crossings and the construction of the Keefer Street Pedestrian Overpass. The success of the Militant Mothers created a sense of spirit and strength in an otherwise disempowered community. They went on to found a food coop for affordable groceries, and advocate for a new community centre to be built. By 1973, the City of Vancouver had agreed to the building of the new Ray-Cam Cooperative Centre, a joint effort of area residents, Canada Mortgage and Housing Corporation, and the City of Vancouver. Ray-Cam officially opened in 1976, as a community-led Cooperative Association mandated to ensure “maximum participation in the planning and operation of the centre’s programs”. Today, the spirit of the Mothers lives on in Ray-Cam’s proud history of supporting families and community. As a local serving centre for several vulnerable populations, Ray-Cam’s programs are vital and irreplaceable: determined as essential services by the Labour Relations Board of BC. To maintain the continuum of recreational and social service residents rely on, and minimize disruption, the renewal of Ray-Cam will be based on a phased construction plan. The new and expanded centre will incorporate features prioritized by local residents, organizations, and centre staff, including: expanded administration and reception; new and expanded multi-use, youth and seniors programming space; new games, drop-in and afterschool space; community kitchen, commercial kitchen, and laundry facilities; new and expanded childcare; seniors drop-in, adult daycare and frail elderly centre; new gymnasium; expanded fitness centre; health clinic; vocational training; media lab and theatre; outdoor and common spaces; and support for local serving retail and social enterprises. The proposal also includes mixed housing in a series of three tower style building forms atop the Ray-Cam facilities. Lastly, an enhanced pedestrian realm, landscaped public spaces, connections to the surrounding neighbourhood, and a fine grained, small frontage retail promenade along Hastings set back from the viaduct knits the entire project together. Using green building principles, the overall development aims to be self sufficient and resilient. To achieve these goals the renewal team has engaged green design leaders Cornerstone Architecture with a view to applying the Passive House Standard to the project. Employing these standards promises not only to increases efficiency and resilience, but to meet and exceed the City of Vancouver’s Greenest City goals. The Ray-Cam Renewal proposes to build to Passive House Standard — the internationally recognized, rigorous standard for low energy use buildings. 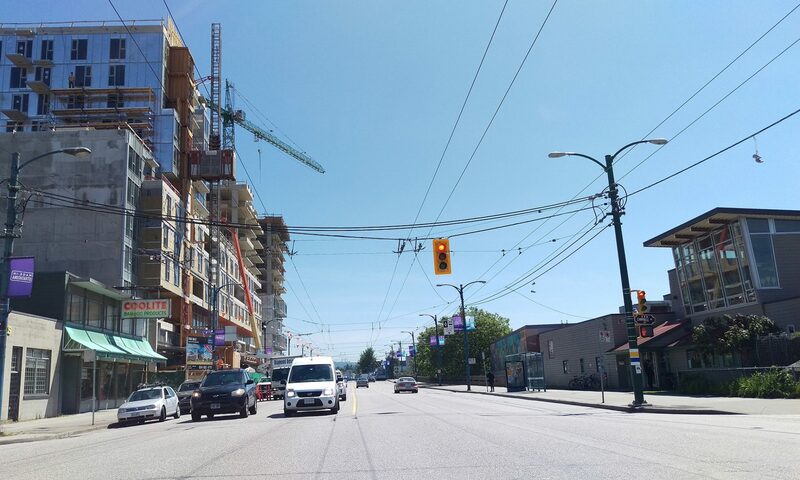 Building to PH Standard, the renewal project can expect significant energy savings over the life of the buildings, while meeting objectives of the City of Vancouver Greenest City goals. Since its inception, Ray-Cam has served as a community hub. Local children, youth, families, and seniors call the centre the community living room – a place where they find friendship, inclusion, support, recreation, training, jobs and inspiration. The centre is resident-led and in turn, responds to resident priorities and aspirations. But the centre is also over-capacity and is increasingly challenged in responding to the demands of a growing local population. Residents are fully engaged in planning. Local organizations, increasingly being priced out of the local rental market, foresee sharing in the new space. Families eagerly await the projected housing. Seniors look forward to supports and homes that will help them to age in place. The Ray-Cam Renewal cannot wait. With support from municipal and provincial partners, other funders and the private sector, residents are hopeful their renewed neighbourhood centre will quickly take shape.